9 February 2012, Gaydon: With the final design signed-off and engineering development work progressing apace, Aston Martin today reveals the first images of the new V12 Zagato (road car) scheduled for production later this year. The V12 Zagato is the pinnacle of the Vantage range. It is also the latest expression of a successful creative collaboration that has given rise to a series of striking GT cars over the last half-century, the original and most iconic of which being the DB4GT Zagato. Not only does this masterpiece rank amongst the most desirable, collectable and valuable cars in history, its 50th anniversary provided the inspiration for the V12 Zagato. Though commemorating a great Aston Martin of the past the V12 Zagato could be no mere pastiche of the original. Instead the project was seen as the perfect opportunity to take Aston Martin’s ethos of technology and tradition to a new and exciting level. To this end the V12 Zagato combines the modern ideas, materials, processes and technology pioneered on One-77, while remaining true to the purity and craftsmanship of its illustrious forebear. Initial design concepts for the V12 Zagato were explored in early 2010. Inspired by Zagato’s bold and individual styling signatures Aston Martin’s Director of Design, Marek Reichman, and his Gaydon-based design team relished the challenge of shaping the V12 Zagato, creating a car that pushes the boundaries of Aston Martin’s design language, yet pays tribute to the DB4GT Zagato. Demonstrating Aston Martin’s ability to rapidly bring ideas to fruition the Zagato programme quickly gained momentum, the design team working hand-in-hand with engineers and artisans to complete the build of a pair of concept cars in the spring of 2011. May 2011 saw the V12 Zagato make its world debut at the prestigious Villa d’Este concours. Entered in the Concept Cars and Prototypes class, the V12 Zagato wowed the judges and the crowd, taking first place against impressive opposition. In June the Villa d’Este winner - along with the second prototype car – made the V12 Zagato’s world racing debut at the gruelling 24 hour endurance race held at the Nürburgring. Both cars completed the ultimate durability test, continuing Aston Martin’s 100 per cent finishing record in this notoriously tough race. After an overwhelmingly positive response from customers, the decision was made in July 2011 to build a strictly limited run of V12 Zagatos. Since then, Aston Martin’s design team has worked to refine the sports car’s detailing and aerodynamic performance while staying faithful to the original design concept. At the same time engineers based at Gaydon have been putting prototypes through the company’s rigorous development programme to ensure the V12 Zagato performs as well as it looks. Every Aston Martin is a unique combination of advanced materials, technology and time-honoured craftsmanship. The V12 Zagato takes this philosophy to a level previously seen in the company’s exquisite One-77 supercar, which completes its build run this year. 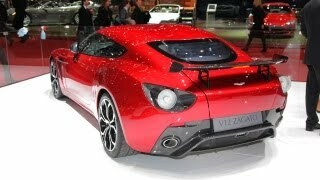 Built at Aston Martin’s global headquarters in Gaydon, Warwickshire, production of the V12 Zagato will be strictly limited to no more than 150 cars. 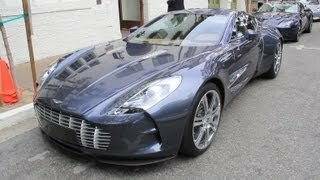 The finished body is then painted in the same dedicated area as the One-77. Four unique colours have been created for the V12 Zagato: Scintilla Silver, Alloro Green, Alba Blue and Diavolo Red. The painting process alone takes some 100 hours to complete and is followed by the marriage of the body and the drivetrain within the sports car production area. From there the V12 Zagato is transferred to the standalone facility originally built to house One-77 production, where the build is completed. Like all Aston Martins when viewed as a whole the V12 Zagato is an artful composition of powerful lines and compelling proportions, but when viewed up close it reveals sophisticated, sculptural surfaces and jewel-like details. The exposed elements of carbon fibre on the front splitter, A-pillars, rear lamp pods, diffuser, door mirror cases and rear wing all display the same perfectly symmetrical weave and smooth resin finish. Likewise the bold new grille is formed in a unique three-dimensional composite material mesh that echoes Zagato’s famous ‘Z’ moniker. More delights are found inside. Seven Bridge of Weir hides – in semi-aniline finish to offer durability while preserving the natural texture of the leather - are used to trim the V12 Zagato’s interior. Hand-stitched quilting of a unique design creates a flowing pattern that evokes a dynamic sense of movement across the seats and headlining, while ‘Z’ embroidery in the headrests and rear parcel shelf add a further flourish. Satin-finish carbon fibre on the dashboard and centre stack is perfectly complimented by piano black accents and satin black rotary switchgear. Carbon fibre sill plaques with ’V12 Zagato’ inlaid metal script provide a distinctive finishing touch.